As a young girl, Leah Otto was captivated by Jude Shetlers good looks and talent as an auctioneer. So when Jude, now a widower with three children, begins to court her, Leah doesnt hesitate. Other men may not appreciate her tomboy ways, but Jude values Leahs practical nature and her skill with the animals she tends, and both enter the marriage with optimism. Yet three months later, Leah feels as if her world is coming down around her. Her twin teenage step-daughters are pushing far too many boundaries, while the five-year-old deeply misses his mother. Leah, more at ease in a barn than a kitchen, struggles with her housekeeping duties. . . . Then a baby is abandoned on their doorstep. Caring for the infant renews Leahs strength to pull her family together. With Judes steadfast support, Leah finds that what she once thought of as a happy ending may be something even betterthe beginning of a life rich in love, faith, and unexpected blessings. "A satisfying story of belonging, love of family, and love for God." 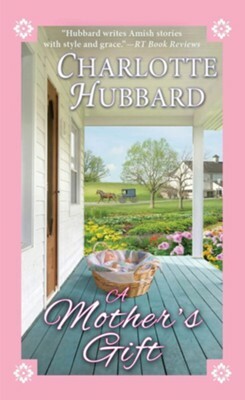 "Hubbard writes heartfelt books with a message." Drawing upon her experiences in Jamesport, the largest Old Order Amish community west of the Mississippi, longtime Missourian Charlotte Hubbard writes of simpler times and a faith-based lifestyle. Charlotte considers it her personal mission to feed peopleto share hearth and home. Faith and family, farming and food preservation are hallmarks of her lifestyleand the foundation of all her Amish romance series. Shes a deacon, a dedicated church musician, and a choir member. When shes not writing, she loves to try new recipes, crochet, and sew. Charlotte now lives in Minnesota with her husband and their border collie. Please visit her at charlottehubbard.com. I'm the author/artist and I want to review A Mother's Gift.